Resonic is a small and lightweight MP3 player. The user interface of Resonic is anything but basic, thanks to it's really cool visualizations including the Waveform graphical element present when playing audio files. Using the program is pretty straightforward thanks to the clear and well thought-out layout of Resonic. Accessing audio files is pure and simple through a tree-like directory layout in the left-hand panel. Version Beta 0.9.1.1690 is a freeware program which does not have restrictions and it's free so it doesn't cost anything. For security reasons, you should also check out the Resonic download at LO4D.com which includes virus and malware tests. Additional screenshots of this application download may be available, too. Editors take a peek at some of the best mp3 players for windows. Reviews are provided along with a channel for technical support through user forums and comments. Downloads are offered as free downloads. 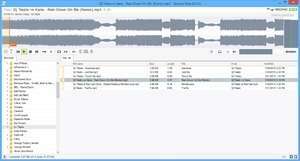 Check out some of the freeware downloads available in the mp3 player category. They contain no strings and are available at zero cost.